Many Americans still envision India as rigidly caste-bound, locked in traditions that inhibit social mobility. In reality, class mobility has long been an ideal, and today globalization is radically transforming how India’s citizens perceive class. 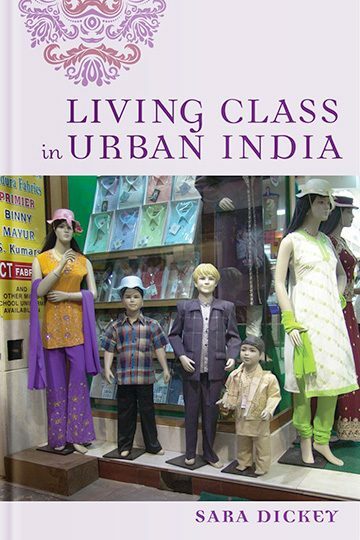 Living Class in Urban India examines a nation in flux, bombarded with media images of middle-class consumers, while navigating the currents of late capitalism and the surges of inequality they can produce. Anthropologist Sara Dickey puts a human face on the issue of class in India, introducing four people who live in the “second-tier” city of Madurai: an auto-rickshaw driver, a graphic designer, a teacher of high-status English, and a domestic worker. Drawing from over thirty years of fieldwork, she considers how class is determined by both subjective perceptions and objective conditions, documenting Madurai residents’ palpable day-to-day experiences of class while also tracking their long-term impacts. By analyzing the intertwined symbolic and economic importance of phenomena like wedding ceremonies, religious practices, philanthropy, and loan arrangements, Dickey’s study reveals the material consequences of local class identities. Simultaneously, this gracefully written book highlights the poignant drive for dignity in the face of moralizing class stereotypes. Through extensive interviews, Dickey scrutinizes the idioms and commonplaces used by residents to justify class inequality and, occasionally, to subvert it. Along the way, Living Class in Urban India reveals the myriad ways that class status is interpreted and performed, embedded in everything from cell phone usage to religious worship.